Each weekday morning Central Standard enters the different worlds of Kansas City. Regular topics include business, personal finance, the environment, information technology, education, music, and the arts. Business correspondent Sheila Roland and a few listeners have a spirited discussion with Devon Jennings, founder of ProMourn, a local entrepreneur that’s making waves. “Cashing In” originally aired July 25, 2014. To listen to the full story, click here. Sheila: I’m speaking today with Devon Jennings, founder of ProMourn, an unusual local start-up. Join our conversation live by calling 816-555-KCUR, or email your questions and comments to centralstandard@npr.org. Find us on Facebook or Tweet us at @CentralStandard. We’d love to hear from you. Welcome to Central Standard, Devon. Devon: Glad to be here, Sheila. Sheila: So, for listeners who might not be familiar with ProMourn, start by telling us what it is and how the business came to be. Devon: Well, Sheila, it all started about 3 years ago when my grandfather passed away. I didn’t know him—he’d abandoned my mother when she was very young—so I wasn’t affected emotionally by his death, and neither was my mother, really. The few memories she had of him weren’t good ones. He drank and was verbally abusive. But at the visitation before his funeral, no one, aside from my mother, father, and me, showed up. For the first twenty minutes or so, the three of stood next to the casket waiting to receive any mourners, and after an hour we’d gravitated to the first row of chairs. The funeral director approached my mother and asked if she wanted to continue the visitation for the remaining two hours, and my mother cracked. She cried like I’d never seen—sobbed, actually. My father and I helped her to the car, and she was so distraught she didn’t attend the funeral the next day. Devon: To see my mother like that? Yes. Much later I realized that what she was probably feeling was a kind of fear and…embarrassment. As I’m sure you’ve experienced, funerals remind us of our mortality like nothing else can, and no one wants to believe that when they pass on not a single person will mourn their death. But to return to your original question, I didn’t consciously think about ProMourn until later. People of my age, their parents are aging, and a number of my friends’ parents died over the course of a year or so, and I was going to more and more funerals. Most of the deceased I didn’t know, or if I did, not well, so it was as if I was being invited to these funerals to in some way share the grief load, if you will. Like the more people who are there grieving, the grief gets spread out and somehow is easier to bear. Last year, as I thought back over all the funerals, it seemed there was a definite need, whether or not people realized it, for a service that provided professional mourners to attend visitations, funerals, and even the after-funeral luncheons. So ProMourn was born. Devon: Yes. Our mourners are trained—highly trained—in grief and grief expression. Devon: Absolutely not, Sheila. Our mourners are totally present in the moment. They are mourning our clients’ departed loved ones. Their training is an intensive eight-week course designed to prepare them for the job. Sheila: You’re listening to Central Standard on KCUR, 89.3, and I’m talking with Devon Jennings, founder of ProMourn. Devon, can you give us a sense of what the training entails? I mean, how does one go about preparing, as you say, for this kind of work? Devon: I’m not comfortable giving the specifics of our training program—it’s one-of-a-kind—but I will tell you that throughout the eight weeks, our mourners are exposed to countless hours of…well, death. Footage of the Holocaust. Nine-eleven. Katrina. The Tsunamis in the south Pacific. Earthquakes and other disasters. Media coverage of school shootings and mass killings, both here and abroad. They’re taught Affective Empathy – essentially they are trained to recognize and further develop our innate human capacity to empathize. There is also an element of Emotional Contagion, where they are trained to receive, or catch, the emotions of those around them. These are basic human functions only we strive to heighten them in our mourners. Sheila: I’m sorry, Devon, but this training sounds just awful. Why would anyone want to become a professional mourner? Devon: Sheila, we’re in a state of almost continuous mourning already. Are we not? There is death and destruction everywhere we turn. Our mourners are just people, like you and me, who decided to turn the grief they feel on a daily basis into something more positive. They can focus the overwhelming feelings they have on our clients’ loved ones. For that moment at least, their grief is not anonymous as it tends to be in daily life. They tell me that its honestly cathartic and for some it’s even spiritual. Sheila: So you haven’t actually done it? Devon: No. I leave that to the trained professionals. Sheila: I see. Funerals are often steeped in religious tradition, so how does ProMourn handle that? Devon: It depends on the client, Sheila. We cater to all faiths and denominations. Part of all of our mourners’ training includes learning all the major world religions’ doctrines on death and the afterlife. They study the death customs and traditions of different cultures and faiths. So, while our mourners aren’t experts, per se, they can take part in nearly all religious funeral ceremonies. And we’re working to hire mourners of every faith to better serve a diverse population. We’ve got Christians and Jews, Agnostics and Atheists, a small number of Muslims and Hindus. We even have a practicing Wiccan…and we’re actively seeking Mormon and Jehovah’s Witnesses mourners. Sheila: We’d love to hear from our listeners. Call us at 816-555-KCUR or message us on Facebook or Twitter. So, Devon, who exactly are your clients? Devon: The simple answer is they are people who have suffered the loss of a loved one and have a desire for people to mourn with them. But I think what you’re really asking is why would someone pay for people to mourn for and with them? Am I right? Sheila: Yes, especially with the rising costs of funerals. Devon: For the reasons I mentioned before. Everyone wants to think people will mourn them when they die. In fact, we’ve even started a service where people dictate in their Wills what tier of service they want ProMourn to provide. We even have installment plans. Very similar to paying off burial plots while still living. Devon: Yes, we provide mourners at every price point. We recently did a funeral for a former celebrity who had fallen out of the limelight in her later years and wanted her funeral to be attended as it would have been during her heyday. As a way to kind of cement her legacy, so to speak. We also do small, intimate services, too. And we just started providing free mourning services for indigents and people who have no family to mourn them. We believe it’s important to mourn the loss of life, regardless of who the person was. Devon: Thank you, Brenda. I’m sorry to hear of your experience, though it exemplifies one role ProMourn can play. Sheila: We’ve got Frank in KCK on the line. Frank? Caller: Yeah, uh, I’ve never called into the radio before, but this clown you got on there now? I couldn’t not call. This guy should be ashamed of himself. He’s full of [expletive removed]—I mean crap. Sorry! Taking advantage of people like he does. It’s sick. I just had to say it. Thanks. Sheila: Thanks for your call, Frank. And remember callers, we’re live on the air here. Devon: Sheila, if I may? I’d just like to say to Frank, and to anyone listening, that ProMourn isn’t taking advantage of anyone. We provide a service that people can choose to use or not use. We aren’t forcing people to do anything. It’s not as if some salesman is knocking on doors here. I just want to get the message out about what ProMourn is all about and what we offer. That’s all. Sheila: But aren’t you, at the very least, cashing in on people’s deaths? Devon: Cashing in? I certainly wouldn’t put it that crudely, but okay…who isn’t? Pick a safety innovation of the last hundred years – seatbelts? Safety glass? Car seats? Life jackets? Elevator brakes? Are the developers of those devices and systems not cashing in on death? What about crime scene clean-up crews? Or homicide detectives? Organ donor services? What about the various ways politicians cash in on national tragedies? Not to even mention the whole funeral services industry. Should I go on? Devon: Look, no one likes to think about it, but death is an industry. I’m not cashing in any more than anyone else; even this radio program for that matter, for doing this interview. ProMourn is a service, just like any other. If a person thinks they might be interested, then he or she should check us out. I think what we do is good and necessary, perhaps now more than ever given our increasingly virtual world. This is about people sharing something real and true…something…human. Sheila: We’ve got another caller, Hailey from Overland Park. Hailey, welcome to the show. Caller: Yeah, hi, in light of the recent tornadoes in Louisburg, I find it incredibly insensitive, shocking even, for Mr. Jennings to be hocking his so-called service and for the program itself to even be airing this. It’s opportunistic on both counts, and I’m disgusted by it. How do you sleep at night? Devon: First off, let me just say how saddened I am by the devastation in Louisburg. Like you, my thoughts and prayers are with the citizens of that community, especially the families of those who died. Second, I understand where you’re coming from, I really do. But I’m not swooping into town trying to sign people up for our service. I’m not flaunting my business in their faces. I wouldn’t do that, particularly not at a time like this. We’re not the NRA holding a rally after a mass shooting. That’s not us. And to your comment about me being opportunistic…well, as I said, if I am, it’s no more than anyone else. Devon: I didn’t tell the radio station that I wanted to schedule this interview right after one of the most destructive tornadoes in the history of the region. If I could predict that, I’d be in a different business. Are you going to rail against the construction workers and contractors that make money rebuilding houses and buildings in Louisburg? By your logic I suppose they should work for free? What about when some company donates to the cause? You don’t think, as much as what they are doing might help, that they’re still not looking out for their bottom line? If Hy-Vee donates a bunch of food and water to the relief effort, do you not see how that’s free advertisement for them? How people might choose to shop at Hy-Vee over, say, Price Chopper based on Hy-Vee’s humanitarian efforts? I’m sorry, but it’s naïve to think otherwise. Caller: But a grocery store donating food and water isn’t as blatantly opportunistic as what you’re doing. I’m sorry, it just isn’t. Devon: If you are inclined to see it that way then I’m not going to change your mind. I’m sorry my company is being perceived that way because it certainly isn’t our intent. Sheila: Thank you for the call, Hailey. We appreciate it. I do want to reiterate, though, that we at Central Standard would never intentionally do something to offend our listeners. The stories and interviews we air are generally planned and scheduled far in advance. As Devon mentioned, we certainly didn’t plan on this interview in any way coinciding with some tragic event. We’ve got another caller, Jacqueline from Lee’s Summit. Welcome to the show, Jacqueline. Caller: Hi Sheila, thanks for taking my call. I just had a comment for your guest…he said a moment ago something about how we are in a state of continual grief, or something like that? Well, I disagree. I don’t mean to sound like I’m unaffected by what’s going on in the world or anything, especially the local tragedies, but I consider myself a happy person, and I think it just comes down to how you see the world and choosing to look on the bright side of things. And there’s already so much ugliness in the world, I think focusing on the positive is just good for everyone. Just wanted to throw that out there. Thanks! Devon: With all due respect to the caller, what she calls looking on the bright side I call not paying attention or simply ignoring what’s around you. But she’s not alone in her views. In fact, I’m sure she’s securely in the majority on this. And she’s not wrong, either. It’s much easier to ignore or choose to look on the bright side when death and awfulness surrounds us. It’s a coping mechanism. It’s difficult to function knowing the state the world’s in. But I’d argue that ignoring it isn’t the answer. So for truly empathetic people like my mourners, it gives them a chance to, as I said, turn the anonymous grief into something specific, and good things can come of that. Sheila: So you’re just doing some kind of favor for your mourners? Devon: No, I didn’t mean that. Only that the act of mourning our customer’s lost loved ones connects our mourners to something communal and real. Real in a way that very little is real in today’s world. And it’s my belief, and the research bears this out, that communal mourning is a positive thing, psychologically speaking. Sheila: Let’s go to another caller. Ray’s on the line. Ray, welcome to the show. Caller: Yeah, uh, I was just flippin’ channels on the dial and heard this. I’m actually working on a crew in Louisburg. A lot of us guys kinda migrate around, doin’ this kind of work. We’re not taking advantage of people. It’s a just a job, and if I didn’t do it, somebody else would. So, this guy your talking to? Seems it’s no different to me. Sheila: Thanks for that perspective, Ray. We’ve got our friend Clarence from Raytown on the line. Clarence, welcome back to the show. Caller: I don’t much get what this fella’s sellin’. Funerals are for families and loved ones, not strangers. When my Margaret passed last year, I’d have been got-durn offended if some stranger showed up and tried to share my grief. But…the last I checked our country’s still free and a man can do whatever he sees fit to make a livin’ at. Didn’t fight the Nazis for it to be any other way. That’s all. Sheila: Thanks, as always, Clarence. Nancy in Lenexa, welcome to Central Standard. Caller: Hi. Thanks for taking my call. I’ve just got a quick comment for your guest, and I’ll take the response off the air. Pardon my frankness, but ProMourn strikes me as you selling people on something they don’t really need. Like, the service creates the need…Thanks. Devon: Thanks for the comment, Nancy. I understand what you are saying, but isn’t that the way of all modern innovation? We didn’t know we needed the microwave oven until it was invented. The iPod? The smartphone? Special laundry detergent? Tooth-whitening strips? Organic food…the list goes on. Obviously, I think ProMourn is necessary in a way that an iPod, for example, isn’t. I saw what I thought was a very real need in the funeral service industry, and I strove to fill it with ProMourn, and I think we’ve done a good job so far. Sheila: You’re listening to Central Standard on KCUR, 89.3. If you are just joining us, I’m talking with Devon Jennings, founder of ProMourn. I see we’ve got another email. This one from Ed in North Kansas City. Ed writes: “Dear Sheila, I’m a big fan of the show. It gets at Kansas City in a way no other program does. Keep up the good work.” Thanks, Ed. We think so too. Ed’s email continues, “I couldn’t help but notice that your guest’s business is, well, I don’t mean to be rude or anything, but it strikes me as an extremely capitalistic venture. Especially given the recent destruction in Louisburg.” Devon, do you have a response for Ed? Devon: This is a business segment, is it not? Pardon me, but does Ed write in to say this to the person who opens yet another frozen yogurt or coffee shop? What about the man who runs a landscaping business? Do you ask him if the reason he’s mowing lawns and trimming hedges is a capitalistic venture? My guess is you don’t. Of course it’s a capitalistic venture. I don’t really want to harp on this, but since the caller brought it up, think about all the different businesses that will benefit, financially, in the rebuilding efforts in Louisburg in the coming months. Every step along the way, money is being made. From the demo and cleanup crews to all the different contractors: plumbers, electricians, dry wall crews, painters, masons, and on and on. Is the town going to get rebuilt better and stronger? Absolutely. But it’s not going to be free. Sheila: We’ve got time for one more call. Uh…let’s see…Chris out in Gardner. Chris, welcome to the program. Caller: Hi, thanks for taking the call. I’m pretty fascinated by this guy’s idea, though I’m curious, what does a person get for their money? You mentioned tiers of service, can you say a bit more about it? Devon: Sure, Chris. For a specific breakdown of our services and the costs, I’d direct you to our website, www.ProMourn.com. But I can give you a general sense now. First, if there’s time, say a person or their family has contacted us pre-death, we do what we can, and what the family or client allows, to get to know the person and their loved ones. We pride ourselves on our mourners’ abilities to actually connect with the grieving family and to not simply anonymously grieve. It’s in the connecting that real mourning happens. If there isn’t as much time and we are contacted post-death, we ask several of the loved ones to fill out a short but thorough questionnaire about the deceased. Devon: Excuse me, Sheila? Can I just say one more thing with regard to the Louisburg tragedy? Sheila: Sure, Devon. Go right ahead. 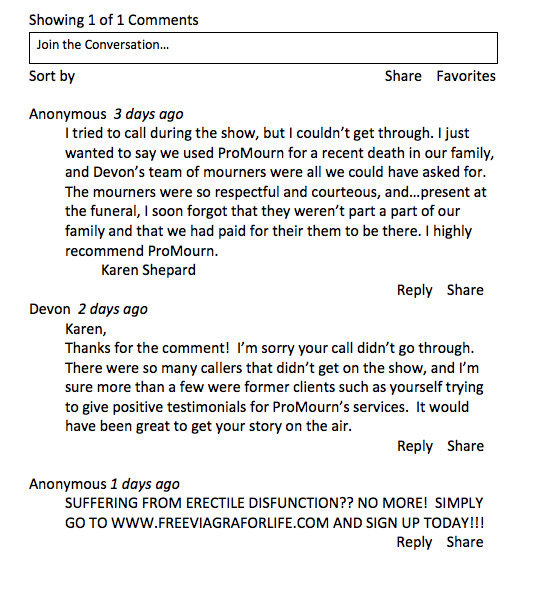 Devon: For the record, ProMourn sent a number of mourners to work the many funerals and remembrances in Louisburg following the tornadoes, free of charge and without, until now, anyone knowing. But that’s not the point I want to make here. Look at the outpouring of support for that community. I mean, all across Kansas City—and the region at large—people have come together and not only donated time and money to search and rescue and clean up but have shared in that community’s grief. We came together in a way that rarely happens in this city, except for when something truly awful occurs, like the Louisburg tornados. Or back in ’88 when those firemen were killed in that construction site explosion. Or the floods in ’93. Or the way the city rallied itself around finding the identity of Precious Doe. Or our outrage in the wake of the recent shootings at the Jewish Center in Overland Park. And nationally, with nine-eleven and Katrina…in the wake of tragedy we come together and share our grief. We mourn communally, and it helps. It really does. That’s all we’re trying to do at ProMourn. Help people. Sheila: Thank you for visiting with us, Devon. Devon: Sheila, thanks for the time. I would like to add, if I may, that if any of your listeners are interested in purchasing a ProMourn service, if they mention this interview we’ll take 15% off the price. Sheila: And where can listeners find out more about your service? Sheila: Very good. Thank you, Devon. For more information about the people and places featured this week on Central Standard, please check us out at www.kcur.org. Thank you for listening. I’m Sheila Roland, we hope you join us tomorrow. Casey Pycior earned his MFA in fiction writing at Wichita State University and his PhD in Creative Writing at the University of Nebraska-Lincoln. He was awarded the 2015 Charles Johnson Fiction Prize at Crab Orchard Review, and his stories have also appeared in Beloit Fiction Journal, Midwestern Gothic, Harpur Palate, Wigleaf, and BULL among many other places. His collection of short stories is forthcoming in late 2016 from Switchgrass Books. He lives in Lincoln, Nebraska with his wife and son.